I am originally from Western Australia but migrated to the UK in 2005. I was an illustrator with over 20 years’ experience in the advertising industry but took the opportunity, on moving to the UK, to turn to fine art, something which I had always wanted to do. 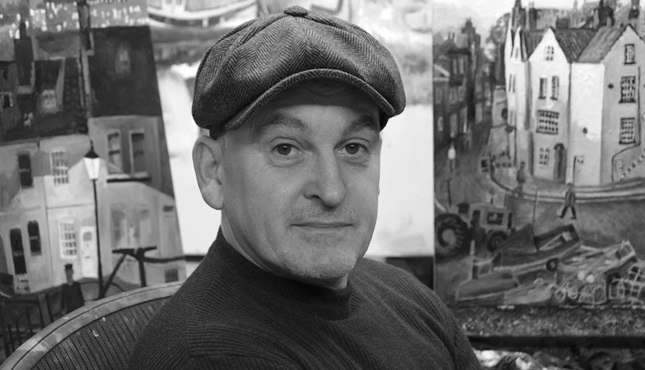 I now paint full time from my studio in Leeds and have developed a reputation and following for my original oil paintings of the beautiful Yorkshire countryside, particularly coastal scenes of the Heritage Coast, such as the fishing villages of Whitby, Staithes & Robin Hood’s Bay. As well as creating original oil paintings which are exhibited in galleries across Yorkshire, the north of England and also in London, I produce limited edition prints of my paintings. I am proud to be an exhibiting member of Leeds Fine Artists (founded in 1874) & a member of the Association of British Naive Artists. My paintings are very heavily guided by the emotions a particular scene or moment evokes in me. It’s this feeling that I try to convey to the viewer. It might be something as simple as smoke drifting from a chimney pot or silhouette created by a particular light source. It may be the strength or history, which emanates from an everyday object or piece of architecture. Over time I’ve discovered that I can best achieve this by exaggerating/characterising colour, manipulating perspective slightly & pushing shape & form to arrive, hopefully, at a nicely balanced place, where the image created has not only captured the physical qualities of the scene, but more importantly, the feeling of the occasion. I’m a self taught painter & not locked into approaching my work with any particular procedure or direction in mind. However, I take photographs of my subjects, but like to rely on memory & imagination, the ultimate goal being, to recreate exactly what I’m feeling onto a flat surface. I don’t do preliminary drawings, instead I prefer to adopt a more organic approach & design the paintings as I go. This helps the end product retain a freshness & feeling of spontaneity. I always have an image & mood in my mind’s eye that I’m trying to put down and I find that working this way allows me to be flexible & go with any happy accidents that more than likely will occur. It’s these little surprises that I can adopt & learn from & take into my next painting. I enjoy the journey that this direct & unstructured approach takes me on & find that it enables me to either get close to achieving what I had in mind & heart or on occasion, arrive somewhere unexpected but as rewarding. A view from the hill across to Hebden Bridge, Calder Valley in West Yorkshire.For.. Format: Limited edition Giclee printed on 310 gsm PH neutral fine art archival paper. Single..
Whitby Harbour North YorkshireFormat: Limited edition Giclee printed on 310 gsm PH n..
A fishing boat’s safe return at dusk to Whitby Harbour, North YorkshireFormat: Limited ..
Fishermen at Whitby harbour, North Yorkshire, taking time to chat.Format: Limited editi.. Fishing boats at Staithes Harbour, North Yorkshire. Taking some well deserved rest.Format:&n..
Robin Hood’s Bay, North Yorkshire.Format: Limited edition Giclee printed on 310 gsm PH neu..
A dreamy & reflective day on the water in the Lake District, Cumbria.Format: Open editio..
Whitby Harbour, North Yorkshire. Format: Limited edition Giclee printed on 310 gsm PH .. Happy chickens & cockerel at a working farm near Scarborough, North YorkshireFormat:&nbs..
A view from Cowbar in the fishing village of Staithes. Always provides inspiration.Format:&n..
A lazy & sunny day on the River Nidd, Knaresborough, North Yorkshire.Format: Limite..
Another visit to Hebden Bridge, a market town at the meeting of the River Calder & the River ..